Miamians of a certain swing always seem to know just where to go on any given night to avoid the rabble, and lately that go-to place has been Cafeina. A multi-dimensional hangout that appeals to all our better aspects, Cafeina came into being with a whisper and is now perhaps the most talked-about hotspot in town. Naturally, there's a good reason for all the chatter, and that reason is one Ivette Naranjo, who not only owns the joint, she gives it that certain swing. What's Cafeina all about? Cafeina is about having fun. It is a chic and sophisticated lounge-meets-art gallery that's laid back at the same time. The tapas menu is light and inspired by my Latin roots. I think everyone can find something they like on the menu. The gallery was a must given that we're in the Wynwood Art District, and we're always looking to support local artists. The garden is great for outdoor concerts, too, and we've got some fun acts in the works for summer. There are so many different parts to the place, but all in all I'm seeking to create a get-away from the expected. Why did you decide to open up in Wynwood anyway? I purchased the property eight years ago and ran -- I still do -- my flooring company from it. Once I heard this was the Wynwood Art District, I moved the floors to the west of the building and created Cafeina on the east side of the building. Now that we're filled in, what's on the agenda for this week? We have our new Art Exhibit titled "Back in the Club Days" by artist Kiki Valdes going up for the month of May. We will host a sneak peek event for him on Thurs., May 6, at 9 p.m. with special guest DJ Dutch. 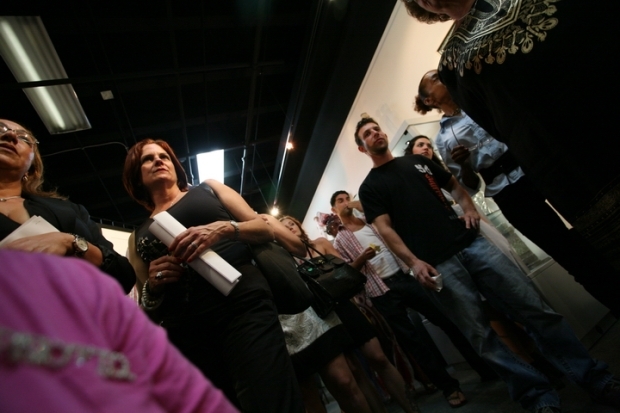 The opening reception is on Sat., May 8, during the Wynwood Art Walk. You chose Pepe Calderin to handle Cafeina's look. How'd the two of you connect and what did he bring to the table, design-wise? I was at a friend's house talking about Cafeina and was explaining to her my vision of the place, when at that time her husband overheard the conversation and said, 'I have a good friend named Pepe who would be the perfect designer to help you carry out this vision.' I spoke to Pepe over the phone, and I just knew he was the one. He understood my ideas very clearly -- it was an instant connection. You're also partnered-up with your mother in the very successful Dupont Flooring, which is about to celebrate its 25th year in the biz. How has being on the building-end of things helped you with running the night? My flooring company installs mainly to government -- for example, the Miami International airport, police stations, Miami Dade School Board, etc. I believe that dealing with the government and with flooring contractors has prepared me to take anything on. It's been a quite a lesson. I believe the hardest part has been changing from my hard hat to high heels. On the odd night that you get to go elsewhere, where else in town do you most dig hanging out? On the "Boulevard" getting a bite to eat and then home to get some rest! What's coming up for Ivette Naranjo? Hopefully a vacation.